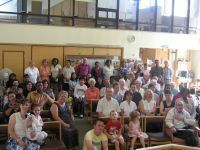 Sunday evening services take place twice monthly and are varied, including prayer and healing, in depth preaching, film evenings and tea and praise times. Please see the 'Regular activities at a glance' page for the schedule in the current month. Communion is celebrated on the first and third Sunday mornings. For Sunday evening Communions see the 'Regular activities at a glance' page or refer to the Forward magazine. Refreshments are served in the hall after the morning services.